It was a very quiet Saturday night as far as boxing is concerned (the off-season summer period) but there were a couple of fights taking place. 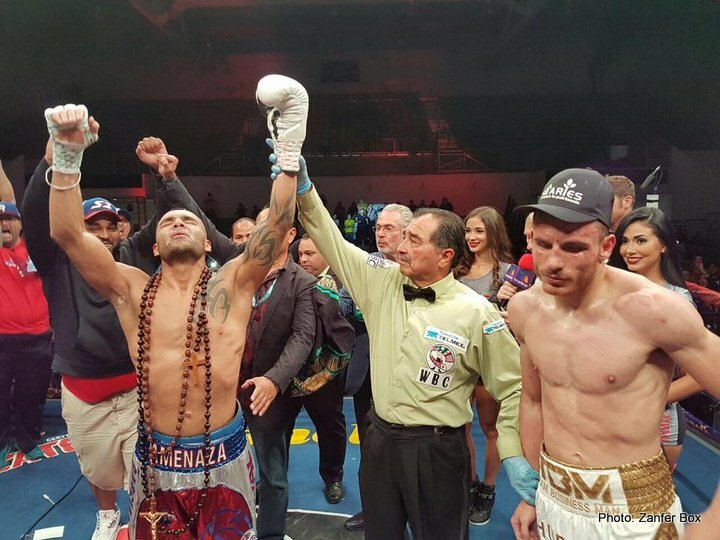 One of them produced a mini upset, as in Monterrey, Mexico, middleweight Roberto Garcia pounded out a pretty wide ten round unanimous decision win over his countryman Omar Chavez to capture the vacant WBC Silver 160 pound strap. Scores were 97-92 and 96-93 twice for underdog Garcia, who is now 41-3(24). Chavez, coming off a big stoppage win over Canelo Alvarez’ brother, Ramon Alvarez, and expected to keep his momentum going as a result, instead fell to 36-4-1(24). From the start, Chavez appeared somewhat listless and lacking in energy, complaining frequently about Garcia’s body shots being low (Garcia was docked a point for a low blow in the 2nd). Chavez was not throwing anywhere near enough punches, caught as he was from time to time on the ropes. His face marked up and reddened, Chavez had to listen as his countrymen in attendance booed his subdued performance. Despite being the younger man by a big ten year margin at age 27, Chavez was outworked, out-punched and out-strengthened. Only in the final round did “The Businessman” come to life and let his hands go, but by this stage the fight was as good as over barring a sensational last-round KO. Last night’s curious showing from Chavez reminded some people of his sibling’s poor effort against Canelo Alvarez back in May, when Julio Cesar Chavez Junior also appeared to be merely going through the motions in that fight. It is now unclear where Omar Chavez goes next. As for Garcia, the tough veteran picked up another win over a biggish name last night, adding it to previous wins over Breidis Prescott, Carson Jones and Victor Manuel Cayo. Garcia has now won 13 in a row since dropping a decision to Antonio Margarito back in May of 2010. Never having been stopped during a pro career that began way back in 2001, Garcia has paid his dues and is deserving of a big payday/world title opportunity.